This project will contribute with new perspectives and understandings in the official debate in Norway, linked to security, collective defense and NATO. The delivery is a series of three seminars linked to Policy Briefs, chronicles and other communication activities. The theme for two of the seminars will be linked to the process in the alliance towards the summit in Warszawa July 2016, while one seminar will focus on the Nordic security dimension, with emphasis on Sweden, Finland and their relations to NATO. This will be planned and arranged in cooperation with NATO’s public Diplomacy Division, Forsvarshögskulan in Stockholm, Centre for military Studies at the University in Copenhagen, Centre for War Studies at Southern Denmark University and the University at Tampere in Finland. The need for an increased official understanding of a debate about Norway’s security- and defense political framework conditions are obvious. The framework condition seems to be rapidly changing as a result of Russia’s acts of war in Ukraine and increased security policy in tension in general. This challenges NATO, EU and the West in multiple aspects. Even thou NATO approved important changes at the Wales summit last year, we can ask ourselves: are these changes sufficient – and necessarily the right actions? Are there being done enough with the relation between for example EU and NATO, when it comes to the nonmilitary- or hybrid and grey side of the conflict specter? Meanwhile goes the debates rapidly in Sweden and Finland, about how to maintain their own security in today’s society, and the extent to which NATO is a part of that solution. For Norway, the Nordic security will be important, while different approach to NATO will put clear limitations on the security- and defense political partnership in the Nordic. However, Sweden’s and Finland’s choices of direction in the years ahead will give direct consequences for Norwegian security- and defense policy. This is a demanding discussion in many ways, which will continue in many years forward. - Is NATO’s ongoing process (as approved in Wales) sufficient to secure a function able collective defense in case of emergencies and conflicts? 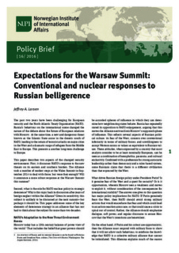 - How can the Warszawa summit contribute to continue deter, and keep security political frames, also against nonmilitary and hybrid threats? - How is the development of Sweden’s and Finland’s relation to NATO, and what consequences will there be for Norway? NATO’s response to the new European security environment: Firm deterrence or symbolic posturing? Expectations for the NATO Warsaw Summit: Is NATO doing the right things – and doing them right? Can NATO’s new Very High Readiness Joint Task force deter?